Business meetings are a topic for tons of jokes. There are a lot of memes made about frivolous meetings. Comic strips and sitcoms highlight and use the inefficiency of meetings as the pitch line. More importantly, any professional who has ever experienced these meetings understand that these caricatures reflect a grain of truth. How can we make meetings more productive? 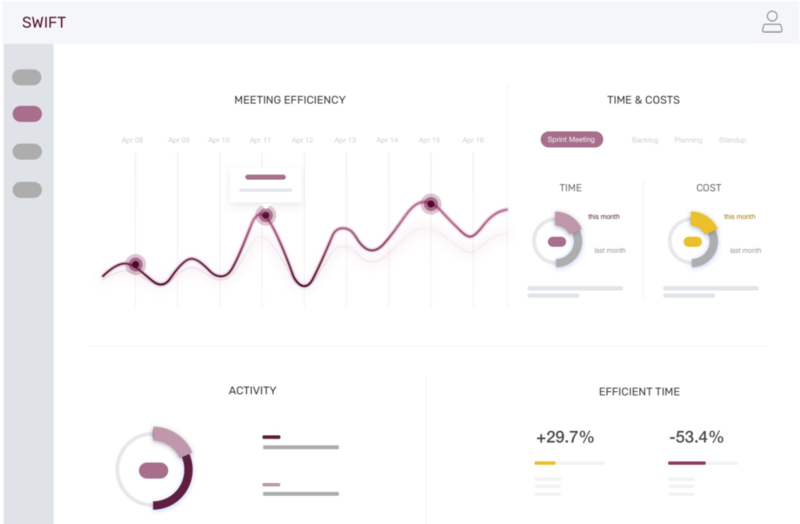 Swift is a web application that helps with meeting preparation and integrates into existing meeting scheduling workflows to create agenda-driven meetings. Meet Jennifer, a 32 years old digital product manager. She lives in rainy Portland, Oregon with her husband and four year old son. She has been working as a product manager for the past seven years. Jennifer’s calendar is filled with back-to-back meetings. How does she get any work done? Even though she prefers to spend her time at home with her family, she often finds herself taking her work home. With all her responsibilities and limited time, she has learned to work smarter not harder. She knows what will make her efficient, and is selective about the tools she chooses to use. Jennifer is always on the lookout for the latest software solutions for project management and task automation in hopes to streamline her workflow for herself and her team. When she finds a tool that she believes will bring value, she introduces and campaigns for it in her organization. Even with her carefully curated set of tools, Jennifer still faces problems. First, her software tools are not connected. She needs to jump from one platform to another to find and collect information. More importantly, there is no tool in her workflow designed to help with meeting preparation. Jennifer organizes a lot of meetings. She understands that having clearly-defined agenda is a vital first step. With her company in its busy season, she also knows that not all of its attendees will read the agenda. She is currently organizing a vital meeting, which aims to set new goals for the weeks ahead based on historical data on the company’s progress. Between her meetings, Jennifer sends her team a calendar invite without including the lengthy, nitty-gritty specifics. On the day of, she briefly introduces her goals and kicks off the process. But without having issued any meeting details, her team didn’t know that they needed to review data related to company progress in advance. So, instead of getting to the agenda that Jennifer had imagined, the meeting was spent reviewing backlogged information and getting the team on the same page. The team lost the opportunity to synthesize data and come up with valuable new ideas, and Jennifer was unable to take that value and propel the company forward. Jennifer made a common assumption— “my team is too busy to read an agenda, and I don’t want important information lost in translation”— which led to common miscommunications and the loss of valuable time. Take Erica, the developer lead, who would have been responsible for grooming and preparing the data needed for Jennifer’s meeting. How could Jennifer have better helped or better prepared Erica for items that impact the whole team? Swift can help. Using our voice integrated web platform, Jennifer can set up meetings and automate tedious tasks. Swift will automatically send out reminders to all of Jennifer’s meeting attendees in visual and audio form. She can also write out a list of critical information that each attendee would need to prepare in advance of a meeting. So, a simple note like: “Erica - please prepare a high level review and summary of data”, will let Swift schedule and send out a targeted reminder to Erica. To help save time, Jennifer can choose from a list of agenda and action item templates. If Jennifer wants to review the backlog with her team in the future, she can pick meeting templates with discussion items and time, such as “ What came up that needs to be resolved?”, “What are the roadblocks?“ or “What is the highest priority?” All she has to do is to find the template that suits her needs. Most importantly, Swift will keep track of meeting times and costs when Jennifer organizes and attends meetings. With the data tracking, everyone understands the cost of a meeting in terms of time and money. Using Swift, Jennifer has a frictionless experience and the data to visualizes her value to her team.